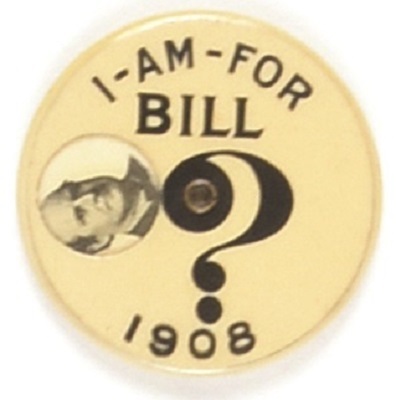 A really unusual kind of campaign pin from 1908. This William Jennings Bryan 1 1/4 inch celluloid has a celluloid disc with hole in it attached on front. Spin the disc and eventually you’ll find your man – it’s Bryan, all right. Very scarce item with unique approach, Whitehead and Hoag back paper, excellent condition.